Decorating this bedroom was a much more harmonious experience than I had anticipated. I was expecting it to be a battle of wills, but in the end it all came together really nicely and my opinionated ten and a half year old loves it. Bella had her heart set on a cabin/loft style bed. Initially, we were open to this, mainly because her room is so small that any extra storage and floor space had to be a good thing. But they were either too young in style, or too tall (we don't have very high ceilings in the upstairs of our house due to the sixties chalet-style roof) or just too pricey, and I was worried she would outgrow it quite quickly. So I suggested we just keep her existing bed and, as we did with Angus's, paint it grey. I have to confess I was thinking about the half-tin of grey paint down in the garage and that it would be good to use it up. Surprisingly she agreed on the proviso that she could pick out the wallpaper that went behind her bed. This seemed fair and she went for gold stars on a slightly off-white background, which I absolutely love, and luckily one roll was enough. We hung a little shelf just to the side of her bed so that she could store her glass of water and book, and her bedside lamp clips on to the side of her bed. The grey faux-sheepskin rug adds warmth and texture to the white floor and the pink metal storage basket is from Ferm Living and one I've had for a few years. It used to live downstairs in the living room and held all my yarn, but as my yarn stash has dwindled so rapidly lately I didn't really need it any more, and thought it would look much better in her room, which it does, holding the many soft toys she absolutely cannot live without. The prints and frames I already had. They hung in other parts of the house and simply changing the frames and moving them to a different location gave them a new lease of life and made me look at them afresh. Bella really likes them because they're pretty but not girly. I like that the colours are bright but not babyish, and they all share the same clean lines and stylised graphics. There is just space at the foot of the bed for a tall, thin bookcase. The curtains and blind are the same as before. Turning the other way, towards the door and bed, there is just space for a little wardrobe and desk, all of which was here before. Bella and I had so much fun arranging her favourite objects and toys on the shelves. The white painted floorboards are one of my favourite things about this room. I know people worry that they are cold but I don't think anything feels warmer than wood underfoot. I just love it. Also, we have central heating and the rooms upstairs are toasty in the winter, to the point that we have to turn down all our radiators, so I'm not too worried about the temperature issue. Also, we had nothing to lose but the cost of a tin of floor paint. The carpet was in such a bad state that we would have had to replace it anyway. If in a few years we decide that painting the floorboards was a disaster, well, we'll get a carpet. You're probably wondering where all the toys are. There are four plastic storage boxes under her bed, holding barbies, Lego, bags, scarves, odds and ends. And downstairs, in the office, we have about eight huge plastic boxes which hold all the children's Playmobil and Sylvanian Families (we have collected a lot of those over the years) which help keep toys out of the bedrooms. We kept to the smallest of budgets, only buying white floor paint, wallpaper, shelf, rug, fairy lights and lampshade. I think we probably spent no more than £100 which isn't bad considering what we did. Floor paint is Ronseal Diamond Hard Floor Paint in white. The tulip print in the black frame is by Inaluxe and the other three are all by Clare Nicolson. Wallpaper is Galerie Stars from John Lewis. It's absolutely beautiful. Clean, bright and airy with bags of charm and character. Great that you both obviously enjoyed the experience too despite your early apprehension. Bella has obviously inherited your flair for creating stylish interiors. I love the arrangement of the shelves, especially the house shaped unit. Really beautiful. It's very grown-up and sophisticated, perfect for a growing girl. I wish her lots of happiness in her pretty room. You've done a fantastic job together, the two of you - in choosing and putting things together, and creating space where there is so little of it! I really like the room, thank you for showing us. It is a lovely space, very fresh and grown up. I would like this in my own bedroom. I think it is a lovely room, all fresh and bright. Her crochet blanket looks fabulous. I love it. Cool, bright but very personal. I would have loved a room like that when I was Bella,s age and I am 58. 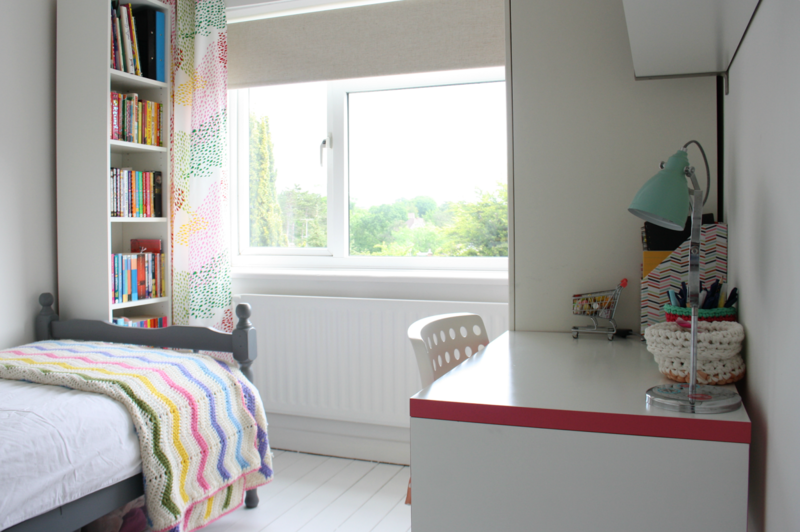 A really lovely room for your ten year old daughter, and you've managed to put a lot into the room without it feeling remotely cramped. I love the tall narrow bookcase, too. White is an ideal background for all the colourful items, the dark grey bed, the pretty curtains and the prints. Well done, Gillian, I love it! Most importantly, I expect Bella does! It's really lovely & the fact that you both enjoyed it together is a bonus. Bella is certainly becoming a young lady, which shows in her choices. Well done to both of you. Take care. It's beautiful. So calm and fresh, and yet full of personality! Just beautiful! Well thought out and such a treat to hear how much fun you had together! Simple canvas with decorative touches...perfect formula :) Going to follow that one! A lovely bedroom... love the wall paper with the grey bed. And so many special Mummy makes! That's a lovely room, the wallpaper is great! it looks bright but cosy! Yes, apretty room without being pink and girly, very sophisticated for a 10 year old! I have a bookcase like that next to my bed but with a flower-etched glass door that keeps it all contained (it also does duty as a bedside table!). I was wondering where she keeps her clothes and if she ever sits at her desk? I had a new desk at that age but soon went back to doing my homework on the floor or a coffee table - same with my daughters who used the dining table... I wouldn't bother with a desk for kids any more, just another surface to clutter up in our case!! What a success this new bedroom is. I'm sure Bella is thrilled with her new more grown up looking room. She has splendid taste in wallpaper!